Antibiotic medications are used to kill bacteria, which can cause illness and disease. They have made a major contribution to human health. Many diseases that once killed people can now be treated effectively with antibiotics. However, some bacteria have become resistant to commonly used antibiotics.Antibiotic resistant bacteria are bacteria that are not controlled or killed by antibiotics. They are able to survive and even multiply in the presence of an antibiotic. Bacteria are naturally present in our environment, and they may be present in the food when you buy it. Poultry and eggs naturally contain salmonella bacteria, for instance. Cooked foods can become contaminated with bacteria from raw meat juices or other contaminated products. Food handlers with poor personal hygiene can also spread pathogens. Antibiotic resistance occurs when bacteria change in some way that reduces or eliminates the effectiveness of drugs, chemicals, or other agents designed to cure or prevent infections. The bacteria survive and continue to multiply causing more harm. Bacteria can do this through several mechanisms. Some bacteria develop the ability to neutralize the antibiotic before it can do harm, others can rapidly pump the antibiotic out, and still others can change the antibiotic attack site so it cannot affect the function of the bacteria. negative effects: the most common digestive problems such as diarrhea, nausea, cramps, bloating and pain. The discovery of antibiotics greatly improved the quality of human life in the twentieth century. 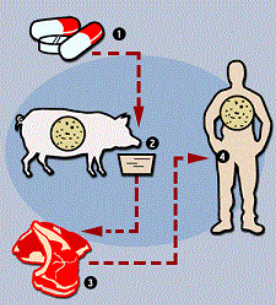 Humans are involved with antibiotics when being prescribed with them to rid viruses and some diseases. Not completing the prescription also causes health issues. close to 70 percent of the total antibiotics and related drugs produced in the United States are fed to cattle, pigs and poultry, according to the Union of Concerned Scientists. Although this practice sustains a growing demand for meat, it also generates public health fears associated with the expanding presence of antibiotics in the food chain.